Later, when I started work, my train of choice was the Karnavati Express which left Dadar at 6:00ish in the morning. I made friends with all the TCs on that route and would be assured a seat in 2nd AC till Surat. The fun, of course was in the second class compartments - the usual expression of newly formed friendships was the shared dabbas containing dhoklas, theplas and basundi chai in a thermos. I travelled to Delhi once on the Gitanjali in the sanitized, aseptic first class AC chair car...only to be impressed by the speed and not much else. I haven't travelled by train much recently, except on the Konkan Railway. The route is definitely beautiful and I have spent many an hour stuck in the doorway, trigger happy with my camera. Who can forget the baked beans on toast in the Deccan Queen or the cheese toast or the omlette sandwich - all eminently avoidable anywhere else but on Indian Railways, washed down with plastic cups of tea. @backpakker: Yes, of course. Ooty is another good train ride too. More reasons to vacation in India. I have to figure out how to get that done. Great post! I could almost travel with you... I wish. I'd love to visit India, such a fascinating place! I can relate a bit to the train stories cause I took many trains in China and in South America - mix of chaos and fun, street merchants hoping in at every stop etc. Used to love travelling first class in those coops. Never liked AC coaches that much but I guess they have phased out the First Class Compartments, haven't they ? 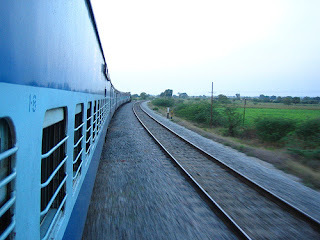 Your post brought back pleasant memories of my childhood days as well when I used to undertake such long train journeys. This year, I travelled on the Shatabdi Express twice and realized how much has changed in terms of service since the earlier days. @sandeepa: You are right. The first class coupes have now mostly been replaced with ac compartments. @indicaspecies: Shatabdis are mostly chair-cars and short-distance trains. But very efficient for business travellers. What a refreshing blog-Mahesh brought it lively-the Chai in plastic cup! Shantanu -the train from Mysore would it be passing thro dense forests of Karwar..? That would have been Awsome..thick jungle,the scent of fallen leaves and your train piercing thro alone-all the 600+passengers ,you feel like part of one group!Though you might have fought with each other earlier while getting into..!! Now on Bhainyo or bahano! @abhay: Thanks for your comments and sharing your experiences! Have you come across the tea sellers on the mumbai - kolkata stretch? I am not exactly sure about the station after which they start appearing but this is what you should look out for: Kharab chai le lo...kharab se kharab chai le lo, ghatiya chai le lo! Someone gave them a course in reverse psychology because everyone buys a cup to find out how bad it actually is!! You stirred my memories of the Theroux classic, The Great Railway Bazar! One day...! @beaverboosh: Oh yes, trains still take us into the romantic past, don't they? Hi Shantanu ! I found your posts very interesting. Last year I had taken a trip by Palace on Wheels. These days, as I figured out, getting berths have become genuinely diffcult. I secured one through a company called Indian Holiday. These guys provided good service though. The journey is truly a lifetime experience. For ABCDs (American Born Confused Desis), it is really connecting with the roots. But I think true India can be experienced in trips by local trains where you see the real people in their daily wears and tears. I am looking forward to one. @jessica: Welcome and thanks for the comment! Yes, local trains are a very different experience and vary with the part of the country you are in. @mansi: You are right. While the stories and the pics whet your appetite, the real fun is in the experience. 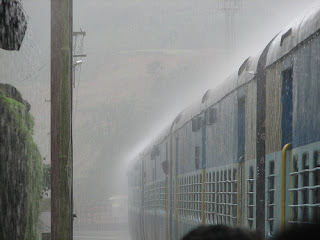 Great post about the train journey in India! Your account on trains and railway stations in India has brought back my childhood memories and my train trips with my family. Train travel is getting better and more enjoyable for upper classes. 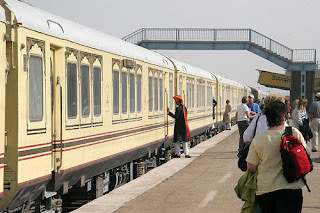 It is well said by you that Palaces on Wheels India for royal Rajasthan train tour is the ultimate train for the Luxury train Travel within India. It’s pleasure reading your travel tale! Came across your train blog today. Very well written. I agree with you totally on your thoughts & those childhood days travelling across the continent every summer/winter holidays. I was born & brought up in Calcutta but my ancestoral family is in Punjab so every school holidays - we used to make the pilgrimage to Punjab. The distance is about 1800 KMs and and I have very fond memories of those trips. The food, the cha, the smells, the noise, the junk food. Bought a smile to face just be remembering it. I should say 'thank you'. Love your blog BTW. I am a foodie and my life revolves around food. 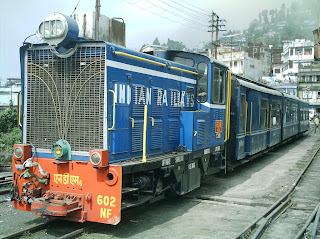 I had clicked the photo of Toy Train, Darjeeling. I remember that you had asked me for permission to paste in on your blog. However, I would appericiate if you could mention it on your blog. @Bishal Rai: I have added the mention and also linked the picture to your Flickr account. Thanks for pointing out the oversight. Amazing, you describe things as if its happening just in front of me..
Chaiwallah and all that ..
brought back wonderful memories of train trip from allahabad to kolkata.. The link to Windamere Hotel is not opening as the URL is wrong ... please make it to http://www.windamerehotel.com/ and also make the linking text "Widamere Hotel, Darjeeling, India" ... as a lot of people scan the page and can easily see Darjeeling, India and click on it (esp the foreigners) ... Thanks, great post, enjoyed reading it. Also will appreciate if I get an email, I need to talk to you about few things. Thanks. Seems, you really enjoyed your train journey. After reading your post, I am also planning to travel by Rajdhani Express from jaipur to Delhi. I think it would be better than booking of flights to Delhi. @Silvia: Thank you for the message! 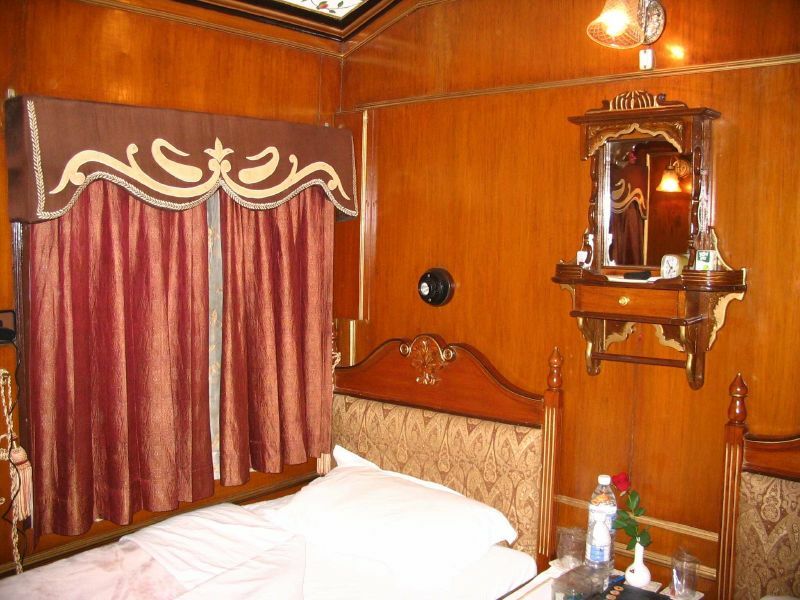 Royal rajasthan on wheels-the one of the best luxury train to travel Rajasthan savor the royalty and experience the opulence of kings on board this ultra luxury train in india. Without a shadow of a doubt, the best way to see India is not on a plane at 35,000 feet, but at ground level on the incredible Indian railway system. In fact, no visit to India is complete without experiencing the bustle of Indian railway stations and a safe & comfortable journey on an Indian express train with the tea seller's welcome cry of 'Chai, chai, garam chai' coming down the aisle. You can safely forget media images of overcrowded suburban trains with people sitting on the roof. On a long distance express in an AC Chair car or an AC1 or AC2 sleeper, all seats and berths are reserved and it’s a safe, civilised, cheap & comfortable way to get around India. 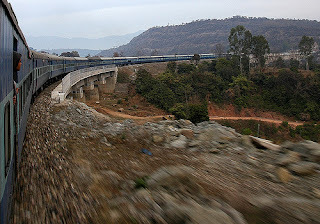 Even long distances such as Bombay to Delhi, Delhi to Varanasi or Delhi to Udaipur can be covered more time-effectively than flying, using overnight AC Sleeper trains, city centre to city centre, saving a hotel bill into the bargain. I found so many entertaining stuff in your blog, especially its discussion. From the tons of comments on your articles, I guess I am not the only one having all the enjoyment here! Keep up the excellent work! Nice post for Luxury train in india but when we talking about Luxury train how can we miss maharaja express the last world of luxury journey across India. You described very well about the train journey. But no doubt there are many luxury trains in India providing better services to travelers so that they can never forget the true experience. always awesome feel to me. Travelling in Maharajas Express train India is my ultimate desire. I still treasured my only tour to India through Maharajas Express http://www.the-maharajas.com. I love the place…! I love the food…! I love the people…! Send a message to the "IRCTC" handle under the Travel category for all your queries regarding ticket availability, bookings, PNR status, and more. Very good article thanks for sharing.. Thanks for sharing such a valuable resource. I appreciate your effort, this resource is really useful for me as well as everyone. I hope you will keep sharing such information in future. Great Article,My experiences with Indian Railway began when I started my engineering degree in Nellore. Thanks for sharing such a valuable resource. I appreciate your effort, this resource is really useful for me as well as everyone. For long distance traveling trains are better options We can not afford air tickets and there aren't many airport. out blogging and I’m currently updating my site as I get a better feel for it.